12mm (long) x 8mm (wide) x 4mm (thick) flat ovals with a polished "window" on each side. 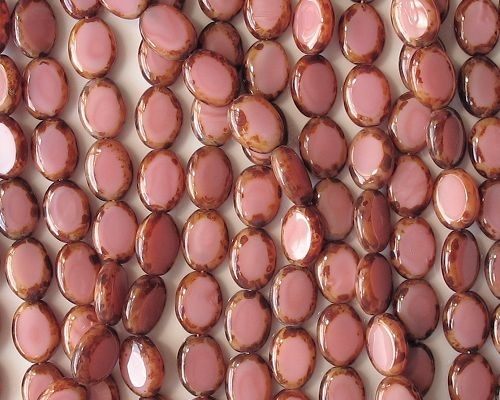 These are commonly known as "table-cut" beads. 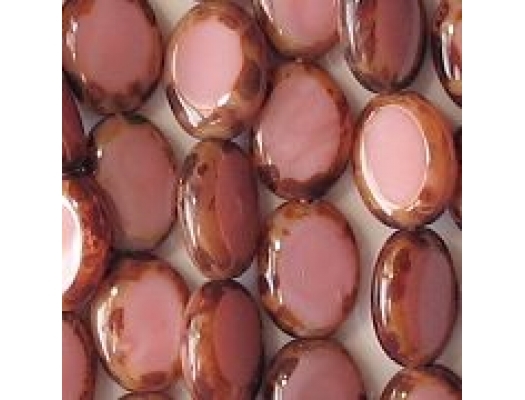 Opaque pink with a brown picasso coating around the edges; the pink glass is not absolutely uniform in color and has some darker swirls in it. I examine all table-cut beads individually and eliminate the defective ones before shipping. Please note, however, that these particular beads have many windows that were polished at an angle, resulting in a lop-sided look. I eliminate the beads that are the most lop-sided, but beads that are only slightly lop-sided are included. Important: The picture shows the original batch of these beads from years ago, but with some adjustments. My supplier has now changed manufacturers. The beads from the new maker are better in that they are more uniform in size and appearance, and the windows are polished more evenly. 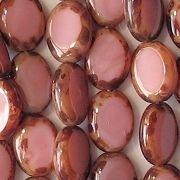 However, the pink glass is a lighter shade than the beads from the old manufacturer. It would be a lot of work to make a new picture, so I kept the old picture, but I lightened it substantially. Thus, the current picture has the right shade of pink and the right shade for the picasso coating -- but the new beads have very flat polished sides (they were slightly rounded in the old beads), and the new beads have a more consistently applied picasso coating. In other words, the beads you'll be getting look better than the beads pictured. But if you have purchased these beads over the years, you should know that the new ones look significantly different.